Don’t put away the winter gear just yet. Some parts of New England are still seeing cold temperatures and you need to be ready to stay warm if you go there. 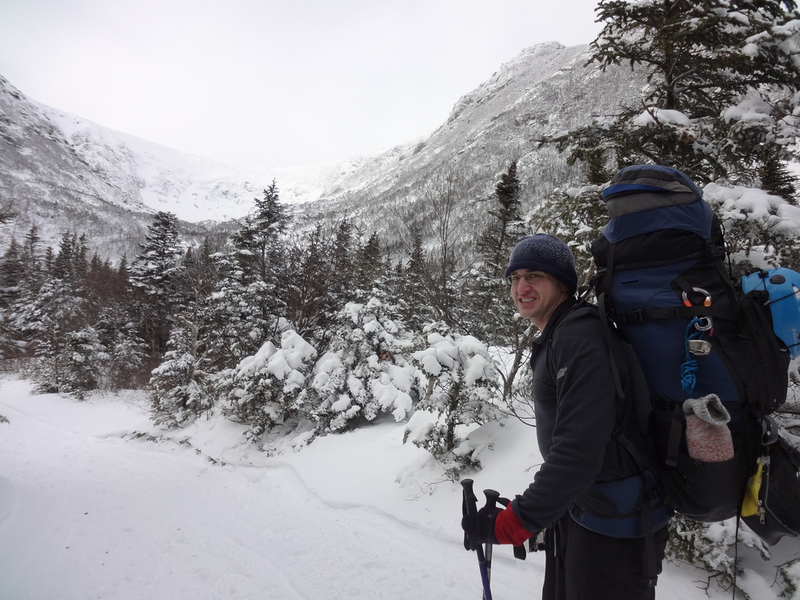 I recently camped near the base of Tuckerman’s Ravine during one of the coldest nights of the winter with temperatures as low as -20. Staying warm can be a challenge when it gets this cold. Below are five tips that will help you stay warm when the mercury drops. Starting a hike in cold weather can be a tricky thing. After emerging from the warmth of your car the coldness of the parking lot may feel like you are in the Arctic Circle. If you are like me then your first reaction is to instantly put on every piece of warm clothing you own but don’t do it! Hiking uphill with a pack will generate unbelievable amounts of body heat. If you don’t layer properly, with a thin wicking base layer, light insulation and a waterproof shell, then you risk sweating and overheating. This will soak your precious insulating layers in sweat, so they will be less effective when you need them, and it will put you are risk of hypothermia when you stop moving. 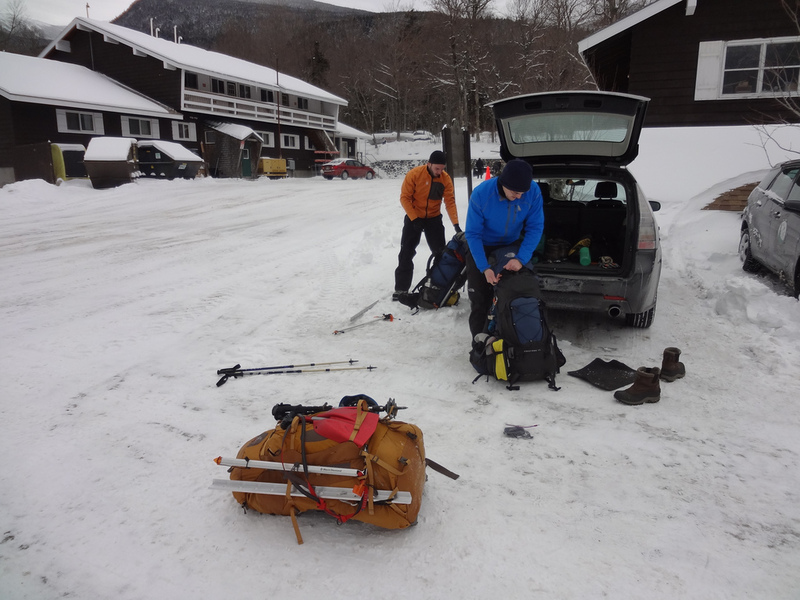 I recently added 1 to many fleece layers in the parking lot at Pinkham Notch. Even though is was well below zero I had to stop at the side of the trail and change my entire clothing system right down to the base layer. The key, for me, is to dress as if it were 20 degrees warmer to account for the body heat that will be generated while moving. You will probably sweat a little even with the best layering systems. This is fine when you are moving but it can be an issue when you stop moving and are in camp for the night. If you are not producing body heat then sweat will quickly work to cool you down. Therefore changing into dry clothes should be a top priority once your shelter is squared away. This will instantly make you feel warmer and it will work wonders for making you feel warmer in your sleeping bag. I always like to pack a thick pair of thermals to change into for lounging around camp and sleeping. Water bottles must be kept in your sleeping bag during the winter so I like to use them as a source of heat. Just before turning the stove off for the night I like to heat my water, pour it back into my bottles and then put that in my sleeping bag. This creates a lot of warmth in my bag and it guarantees that my water won’t freeze overnight. If you do this please do be careful to not burn yourself or any of your gear. 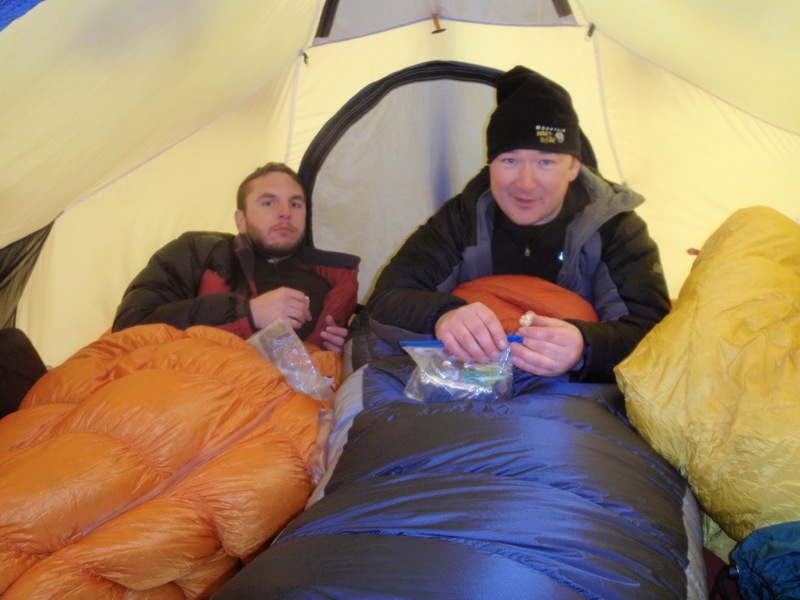 Sleeping pads should insulate you from the cold ground and they should prevent your body heat from being transferred to the ground. During my Hermit Lake trip I only used a Thermarest Pro Lite air mattress. Although I felt warm during the night, the ground told a different story when I took the tent down.I had transferred enough body heat into the ground to melt the snow. My tent mates did not do this on their sides of the tent because they had better sleeping pad systems This is potentially dangerous because it means I was losing valuable warmth. I still use the Pro Lite but I now put it on top of a closed cell foam pad and this has solved the problem. Food is one of the most critical components to stay warm in the winter. I am not an expert on nutrition but it is safe to say that your body needs thousands of calorie’s to keep you warm and to provide fuel during winter hiking. Eating all of these calories in one sitting is certainly not a good idea. Therefore I recommend eating small snacks frequently throughout the day or when you wake up in the night. If I wake up during the night I will usually eat a snack to fuel the internal fire. It is important to choose foods that will be nutritious, tasty and unfrozen when you want to eat. My personal favorite snacks are organic toaster pastries as well as nut and berry trail mix. These have lots of calories and I can eat them with my gloves on. I know that toaster pastries are not exactly health food but they work for me when I am on the trail. These tips are some of the tricks I use to stay warm while hiking when it is extremely cold. What are your tips for staying warm when the mercury drops? 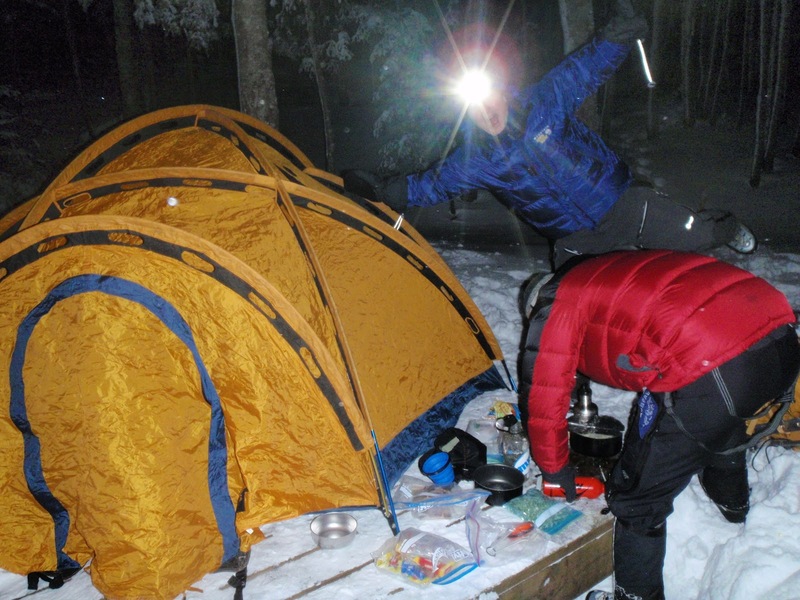 February 22, 2012 in cold weather, NH, staying warm, tuckerman's ravine. I like to always wear contact gloves when doing tasks around camp. I use them all the time. If you see your hands when you are out in the forest , then they are getting cold. I like to keep a pack cover on my bag so when I stop I plop it down and can sit on something warm and off the snow pack. great point, exposed hands are cold hands! the pack cover is smart to. It is also nice to use the pack cover to protect your pack from blowing snow during the night.